Looking for a way to see San Francisco’s amazing sights without the major workout of walking up, down and around the city’s steep, near vertical streets? See it easily and see more of it on a guided Segway tour. For a really fun and interesting time, pick the one that takes you to the places you came to see – the Wharf and Waterfront, Golden Gate Park, or the neighborhoods of Chinatown, North Beach, Little Italy and the Embarcadero at night. On a Segway, with a fun, knowledgeable guide leading the pack, you’ll see places and details you might never find on your own. While each tour is a totally different visual experience, they are all the same in important ways. They’re all fun, interesting, easy, safe, and the guides are great! With a maximum of 8 riders per tour (ages 12 and older, 18 and under accompanied by an adult), camaraderie develops between guide and riders, making it a really pleasant experience. Never ridden a Segway before? No worries. The Electric Tour Company staff makes sure you get the hang of it before you take off. All San Francisco tours begin with a training session lasting about ½ hour. You quickly see how easy it is to glide upright on these really cool Segways with lean/steer technology, and the friendly staff takes their time to make sure everyone is comfortable. When everyone’s set to go, the ride starts out slowly to get used to the sensation of moving while standing upright! In just a couple of minutes, first-timer tension melts away and off you glide! San Francisco’s picturesque, active working waterfront, lined with wharves and piers is so legendary it’s on most visitors’ must see list. Sure, you can walk it, but seeing it by Segway is a blast! With your guide in the lead, you see things you would never notice wandering around on your own. You’ll glide along famous Fisherman’s Wharf, piled high with Dungeness Crabs (during season), by Municipal Pier and the Aquarium of the Bay. Along the way, you’ll see every kind of maritime vessel imaginable: 5 historic sailing ships lined up at Hyde Street Pier, colorful working fishing boats tucked into harbors, a WWII Liberty Ship, even a submarine. Along Fish Alley, the center of the Bay Area’s fishing industry since the mid 19th century, fresh fish takes on a new meaning as you venture behind the scenes where the catch is brought in daily en route to San Francisco’s great restaurants and beyond. Simple, tiny Seaman’s Memorial Chapel is special and off the beaten path, but your guide will get you there. Along the 2.5 mile tour with 10 stops, views of the Big Bay are spectacular offering endless photo ops: somber Alcatraz atop a rocky mound, Golden Gate Bridge, red and grand, vessels of every shape and form crisscrossing the wide expanse of water. Shops are everywhere, and while chocolate is no longer made in Ghiradelli Square, the smell of chocolate lingers in the samples available everywhere. 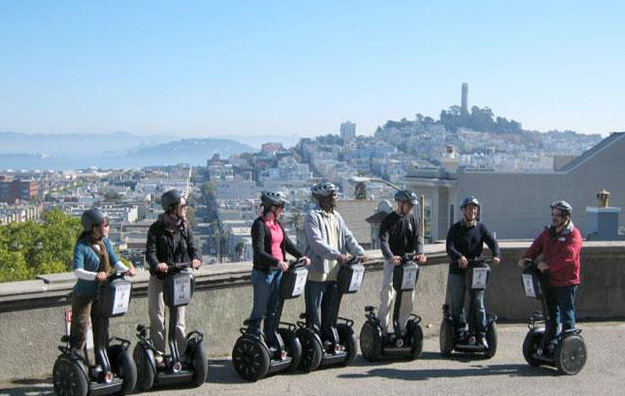 Experience the joy of a Segway ride through San Francisco’s iconic park, the place of outdoor leisure since it opened the late 1800s. Exploring it on a Segway is especially great for families with kids age 12 and up! Time flies by on the 2.5 hour guided tour which meanders for 7 interesting miles along paved and unpaved paths in the 1107 acre park. The tour meets everyone’s expectations – young, old, and everyone in-between. There is something spectacular to see around every corner: intricate pagodas, a rock castle, fountains; brilliant flower banks exploding in color, an interesting mix of architecture, each with a story to tell, and groves of Eucalyptus, Redwoods and Monterey trees; a windmill, a carousel, ponds, bridges. Check out the grass growing on the roof of “green” California Academy of Sciences; take photos of the striking copper de Young Museum; feel the serenity of the Japanese Tea Garden; take in the splendor of the Conservatory of Flowers. And these are just the well-knowns! Electric Company guides know this park inside and out. They’ll show you all the hidden gems. Along the way there’s no end to photo ops, and the comfortable pace and ample stops allow for plenty of time to soak it all in. Just take hold of the handlebars, let the Segway handle the balance and your engaging guide show you the way. Who wouldn’t like a night ride through 3 of San Francisco’s most storied neighborhoods: Chinatown, North Beach/Little Italy and along the Embarcadero. Not just any ride -on a Segway! It’s a great way to spend a fun, out-of-the- ordinary San Francisco evening! With a great guide leading the way, imagine navigating your way through and busy, bustling Chinatown down main streets and narrow alleys, past intriguing storefronts, temples, restaurants, with signs, signs, and more signs in Chinese glowing and blinking everywhere in multi-colored lights. See North Beach/Little Italy in full color as the outdoor cafes light up for the night, and pass all those haunts made famous by the Beat Generation. The Embarcadero after dark takes on a totally different vibe. A place of gorgeous views bay views by day, everything sparkles at night – the city skyline on one side, East Bay on the other. Oakland twinkles across the bay to the east; boats slip by quietly aglow on their night runs; suspension wires glow like silver threads along the sweeping curve of Bay Bridge; Fisherman’s Wharf is alive with music and the night crowd.